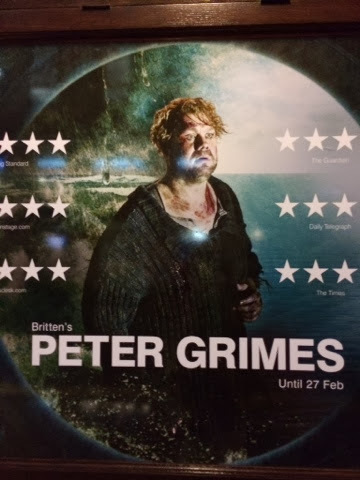 Last night Stuart and I went to see Benjy Britten's opera Peter Grimes performed by the English National Opera. Having seen it put on a few years ago at The Royal Opera House it was interesting to see this production at the London Colesium. Sadly it wasn't as good. Not least because the lead actor was ill. His understudy was ill. The lead lady was ill. And her understudy was ill too. So with the entire A team ill and the entire B team ill too we got some (admittedly excellent) stand-ins to make up the C team. Not a good start. The orchestra was fine and the singing good but the production was only OK - bonkers in places and slightly overblown - it just never really engaged. We didn't really care what Peter Grimes did, or didn't do. It didn't help that the auditorium was boiling hot and the long ponderous pauses did little to keep a few people near us from nodding off. The overlong three and half hour running time could have been snipped a bit.